Cardiovascular magnetic resonance (CMR) imaging is a modality ideally suited to the study of the cardiovascular system in the setting of obesity, as it is not subject to the same restrictions of acoustic window that occur in echocardiography. We sought to use CMR to investigate the effect of increasing body mass index (BMI) on LV and RV structure and function across a wide range of BMI measures. The cardiac phenotype of obesity includes elevated ventricular mass and cavity dilatation. The traditionally accepted mechanism for left ventricular adaptation to obesity suggests that cavity dilatation in response to increased blood volume and elevated filling pressure results in left and right ventricular hypertrophy as a compensatory mechanism for resultant increase in wall stress. Our hypothesis was that, instead, initiation of left ventricular hypertrophy in obesity may be explained by changes in hormonal milieu and not by cavity dilatation. Eighty-eight female subjects without identifiable cardiovascular risk factors, covering a wide range of body mass indices (BMI range 18.7 – 59.2 Kg/M2), were separated into quartiles; normal (BMI 21.2 ± 1.6), overweight (BMI 28.3 ± 2.2), obese (BMI 34.7 ± 2.0) and severely obese (BMI 45.0 ± 4.7). All subjects underwent cardiovascular magnetic resonance at 1.5 Tesla for the assessment of LV and RV mass (g), LV and RV end-diastolic volume (EDV; ml) and LV and RV Ejection Fraction (%). Fasting blood samples for glucose (mmol/L), cholesterol (mmol/L), insulin (μu/L) and leptin (ng/ml) were taken on the day of scanning. All quartiles were well matched for age, height, blood pressure, glucose and cholesterol. All subjects were normotensive (SBP 121 ± 11, DBP 74 ± 8 mmHg), normoglycaemic (5.0 ± 0.6 mmol/L) and normocholesterolaemic (5.0 ± 0.7 mmol/L) on the day of scanning. As expected, BMI correlated positively with LV and RV mass as well as LV and RV end-systolic and end-diastolic volumes (Figure 1). 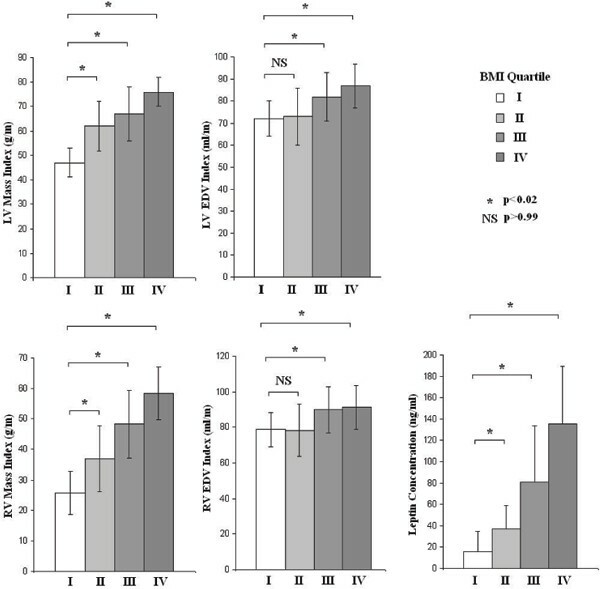 Importantly, however, on transition from normal to overweight, a significant left and right ventricular hypertrophic response (LV: 78 ± 11 g vs 103 ± 16 g, p < 0.001; RV: 26 ± 7 g vs 40 ± 11 g, p < 0.001) was observed in the absence of changes in LV and RV volumes (LV end-diastolic volume 119 ± 15 ml vs 121 ± 21 ml; p > 0.99, RV 131 ± 17 ml vs 130 ± 24; p > 0.99). Furthermore, significant increases of serum leptin levels occurred at this pre-obese stage compared to normal subjects (15.6 ± 19 ng/ml vs 36.5 ± 22 ng/ml; p = 0.013), whereas serum insulin levels remained similar between the lower two quartiles (3.3 ± 1.8 mmol/L vs 4.4 ± 3.0 mmol/L; p > 0.99). Left and right ventricular hypertophy precede ventricular cavity dilatation in response to increasing Body Mass Index. Elevated leptin levels may be responsible for this early effect of ventricular mass. In a cohort of healthy female subjects with a wide range of BMIs, left and right ventricular hypertrophy precedes cavity dilatation in pre-obese individuals, whilst in manifest obesity, both cavity dilatation and ventricular hypertrophy ensue. Elevated leptin levels may be responsible for this early effect on ventricular mass in response to increased body weight. This suggests that left and right ventricular adaptive changes to increasing fat mass occur in two phases, an early, predominantly leptin mediated, hypertrophic response with modest weight gain, and a later mixed endocrine-volumetric response characterized by cavity dilatation and wall stress-induced eccentric hypertrophy. Cardiovascular mortality has been shown to be higher in overweight pre-obese individuals than normal weight individuals, and leptin induced left and right ventricular hypertrophy may be one potential mechanism for this.